The CLS was launched with three engine choices: two diesels – including the most powerful Mercedes-Benz has ever produced - plus a solitary petrol. All displace 3.0 litres and have six cylinders, and come from the new modular generation of straight-six powerplants, with 4Matic all-wheel drive and a nine-speed automatic gearbox as standard. Later the AMG 53 and entry-level petrol and diesel units will follow, the latter from a new stable of four-cylinder engines promising both greater efficiency and driving enjoyment than those currently available. Two versions of the same engine here – but it’s a technically fascinating unit featuring exotic sounding tech like stepped-bowl combustion, nanoslide coating and variable valve-lift control. We won’t explain what those are (although we could, obviously) because in short what Mercedes-Benz is promising is the engineering holy grail – more power and better efficiency. The least potent model from launch is the CLS 350 d 4Matic, which offers a still-respectable 286hp at 4,600rpm and 600Nm of torque from 1,200-3,200rpm. Despite packing the smallest punch it still sprints from 0-62mph in 5.7 seconds and goes onto 155mph – sizeable performance from what is likely to be the best all-rounder in the CLS range. It’s also really refined. At idle there's some background low-frequency noise, but you certainly can't feel it. It pulls well from low revs, with just a muted growl, and cruises exceptionally quietly at UK speeds. For extra shove look no further than the CLS 400 d 4Matic – this delivers muscular excess in the form of 340hp at 4,400rpm and a tyre-smearing 700Nm of torque from just 1,200-3,200rpm. 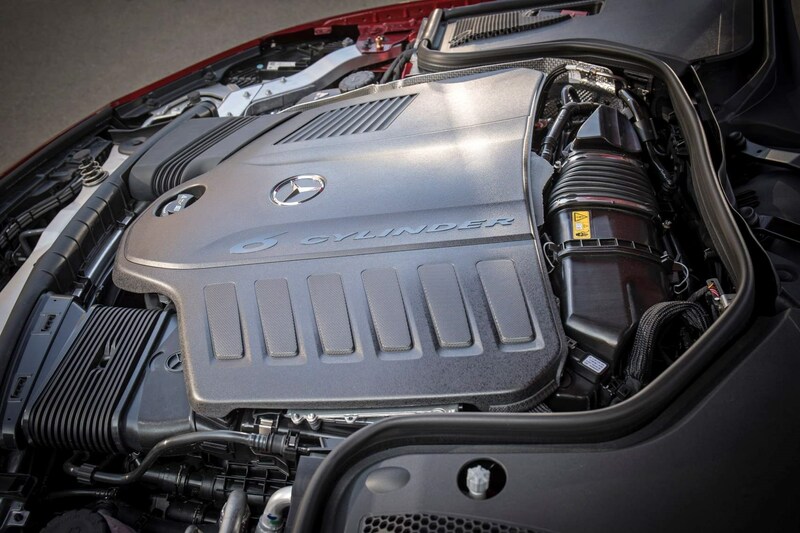 As we eluded to above, this is the most powerful series production diesel engine Mercedes-Benz has ever produced – so expect 0-62mph to flash by in five seconds flat and a top speed of 155mph. To put it bluntly it’s an absolute sledgehammer of an engine with effortless acceleration from very low revs and a deep well of power held in reserve. It’s near silent while cruising and develops a menacing grumble when pushed. As such, it suits the CLS handsomely. Only one choice here from launch – the CLS 450 4Matic – which is an inline six-cylinder with assistance from something called an EQ Boost electric motor and 48-volt electrical system. What does all of this do? Well, the electric motor, powered by energy otherwise lost during braking, is able to fill in the petrol engine’s power gap at low revs to offer seamless acceleration. So on top of the 367hp from 5,500-6,100rpm and 500Nm between 1,600-4,000rpm produced by the petrol engine, you also get an extra boost of 22hp/250Nm from the electrical system. Unlike a full hybrid you can’t waft along in all-electric mode, but where possible the combustion engine shuts off so you can coast, before it’s quickly fired back up by the EQ Boost motor. In Comfort mode its 48-volt system does a very good job of going about its business like a hybrid. The transition from engine off to engine on is imperceptible from the passenger seat – you only know when by watching the tacho. All of this points towards improved economy as well as speed and Mercedes-Benz backs this up with a bold claim - the CLS 450 4Matic provides the performance of an eight-cylinder engine with fuel savings akin to a high-voltage hybrid. Its figures are certainly impressive – 0-62mph in 4.8 seconds and a top speed of 155mph – and claimed fuel economy that we’ve covered in the Running Costs section. The performance is noticeably more vivid than the diesels, which are muted and refined machines. When allowed to stretch its legs, the petrol CLS is a sportier, more responsive beast. Currently top of the tree in terms of performance (and length of badge) is the Mercedes-AMG CLS 53 4Matic+ - a standalone performance model, like those badged 43 within the C and E Class ranges, that act as an entry point to a full fat, V8 AMG model. Got it? This uses the same 3.0-litre petrol inline six-cylinder plus EQ Boost motor as the CLS 450 4Matic but with some future-gazing tech bolted on – enough for Mercedes-Benz to claim that this is the most sophisticated engine it has ever made. Power is up to 435hp at 6,100rpm and 520Nm of torque from 1,800-5,800rpm. Predictably that means a best-in-range 0-62mph time of 4.5 seconds and a top speed of 155mph. Like the lesser petrol the AMG car also features an EQ Boost starter-alternator for a temporary lift of 22hp and 250Nm of torque, and 48-volt electrical system powering things like the water pump and air-conditioning. How is it different from the CLS 450 4Matic? Well, it’s largely down to the extra boost of a special electric auxiliary compressor. This boosts turbo performance at low revs, which means you get even less lag, a more responsive throttle pedal, and plenty of get-up-and-go. The net result is heady performance and a nicely linear power delivery, plus an evocative exhaust note befitting of an AMG model. Although if we’re brutally honest, it’s not as soulful as the older 43-badged V6. We’ve also had an early drive of the new 2.0-litre, four-cylinder petrol engine that will eventually make its way into the CLS. It uses similar EQ Boost tech as the larger six-cylinder motors, this time producing 300hp and 400Nm plus 14hp and 150Nm of electrical assistance. The latter is deployed at low revs, again, to help torque-fill an area of comparatively low performance in a traditional combustion engine. It works well, although the CLS begins to feel its size while pulling off and accelerating in higher gears, where there is still a noticeable amount of lag. The noise it makes is quite gruff too, which feels a bit at odds with a luxury car. All variants of the new CLS feature Mercedes-Benz’s fast-shifting 9G-Tronic automatic gearbox. This promises imperceptible changes for comfortable cruising, or rapid-fire shifts when pressing on. A choice of modes from the Dynamic Select menu gives you a choice of Eco, Comfort, Sport, Sport Plus and Manual shifting behaviours ranging from languid to hasty. The CLS 53 4Matic+ uses an AMG-tweaked Speedshift version of this ‘box, with faster paddle responses and double declutching function for multiple downshifts, so you can rapidly decelerate before a corner and ensure you’re in the correct gear for the exit. Our first drive of the CLS wasn’t exactly in ideal conditions thanks to a substantial amount of snow on the ground. That said, it did give us a good idea of how the standard-fit 4Matic all-wheel drive copes in challenging conditions. In short, it grips very well indeed, offering huge traction from both ends of the car for confidence-inspiring levels of roadholding, even on wintry tarmac. As a default the CLS sends 70% of its power to the rear wheels, so it feels nicely balanced when pressing on, and a clever electronic traction control system shuffles torque around so successfully Mercedes-Benz claims it doesn’t need to fit a limited-slip differential, which saves weight. Your common-or-garden CLS comes with passive steel suspension as standard with the promise of a well-balanced ride and tauter handling than an E-Class saloon. As an option you can select Dynamic Body Control adaptive suspension, which offers a broader spread of talents thanks to Comfort, Sport and Sport+ modes. Finally there’s the top-level Air Body Control air set-up, which we sampled at the launch event and were quite taken by. It’s unlikely to be a cheap option but makes light work of rough roads and gives the CLS a wafty quality, without inducing seasickness. You can also pump it up by 15mm to traverse challenging surfaces. The CLS uses a clever multilink front suspension system with lots of lightweight aluminium components to help enhance front-end agility. As a result the coupe responds quickly to steering inputs and turns into corners with confidence – aided by electro-mechanical steering that varies its ratio in response to steering angle. Put shortly – the steering feels slow around the straight-ahead position and faster when wound all the way round. There’s a lot of car here and as such bodyroll is inevitable. 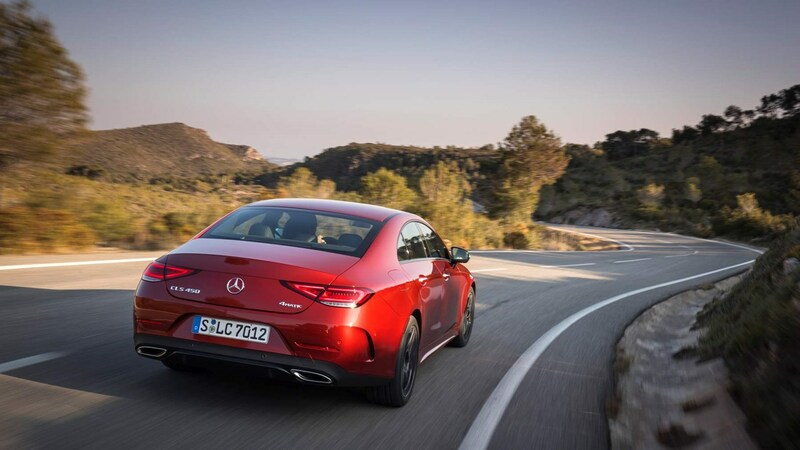 Happily it all happens in one go - the suspension and anti-roll bars stabilize the car quickly - so you don’t need to let the CLS settle for long before changing direction again. Standard-fit Dynamic Select allows you to tailor the car’s responses and control weights, with increasingly performance-orientated Comfort, Sport and Sport+ modes on offer. Slowing a big, heavy car full of leather and wood is no easy job but thankfully the standard fade-resistant, internally ventilated CLS brakes are more than up to the job. You also get Mercedes’ clever Adaptive Brake tech, which includes hill-start assist, automatic handbrake application and the ability to prime the brakes for an emergency stop when the car senses the accelerator being suddenly released. They also dry themselves by wiping the pads against the discs periodically, to improve wet weather performance. The sportiest CLS features much of the same tech as the standard car but with everything amplified for maximum driver enjoyment. All-wheel drive (now called 4Matic+) works faster to deliver traction where it’s needed most, while air suspension is fitted as standard with a specific AMG tune. Adaptive dampers firm up the spring rate when cornering and braking to reduce body movements and geometry tweaks including more negative camber on the front axle improve cornering grip. The steering’s a real highlight, an AMG hallmark, with a nicely judged weighting and level of feedback, plus in the car we drove, an alcantara wheel to hold onto. The AMG CLS still feels like a big car but it’s noticeably sharper in all dimensions than the standard CLS coupe. We can’t wait to get one in the UK, with no snow and summer tyres. The interior of the Mercedes-Benz CLS features swoopy lines, four central air vents and a dual-screen widescreen display. So far so E-Class, you might say, and if you want a more detailed view of this car then our E-Class Saloon review can give you a good impression. We’ll deal with the subtle differences here though - most notably the larger, S-Class-alike wheel with its plethora of buttons including those for the cruise control, which used to live on a stalk. You still get the touch-sensitive buttons on the wheel like an E-Class, and these respond to swiping movements to control the entire infotainment system without having to take your hands off the wheel. Another eye-catching feature is the extensive LED ambient lighting – not itself a new thing, but this time around it has spread to the air vents too. As well as shining in your chosen colour (there are 64 of these) the air vents pulse blue or red when you adjust the climate control. Lighting around the widescreen display helps separate it from the dashboard visually, and as with the E- and S-Class it adds to the high-tech feel in the CLS. Two 12.3-inch screens share the same glass front in an effort to make them look homogenous, but in reality it still looks like two displays rather than one. You can now command the climate control and seat heating or ventilation, plus interior lights, massage seats, perfume diffuser and head-up display with voice control. Just be sensitive to how yelling ‘front passenger fragrancing, high level’ could be taken. A clear and bright (optional) head-up display contains enough information to remove the need to look away from the road and features a light sensor to adjust its illumination automatically. Finally a wireless charging pad can be added to the centre console storage compartment for seamless recharging of so-equipped smartphones. Without seeing a UK-spec AMG 53 it’s hard to comment but the German-registered cars we drove looked suitably sporty inside. Bucket seats are comfortable and supportive while red seat belts and contrast stitching lend an air of gentleman’s wash bag to the proceedings. The AMG Performance steering wheel in nappa leather with grippy microfibre sections is a delight too – not overly padded and a good size for spirited driving. The Mercedes-Benz CLS rides beautifully (in Spain, on the optional air suspension), has squashy seats and is near-silent on the move, so it ticks all our requirements for a luxury car. In particular, we were impressed by the ride from the sophisticated multi-chamber air suspension – this is aided by continuous, electronically-controlled adaptive damping, which can alter the stiffness at each wheel individually to deliver the best ride on cracked tarmac. Whether or not it’ll fare quite so well on standard springs in the UK will have to be seen, but we reckon it’ll toe the line between comfort and poise. The seats in the Mercedes-Benz CLS were designed exclusively for this car, with the two outer rears mirroring the fronts in terms of design, for a sporty single seat look. They’re also really comfortable, feeling large even for a six-foot-plus driver, and offering substantial bolstering in the faster AMG model. Optional Active Multicontour Seats react to hard cornering by inflating their sides to support you better, and feature a massage function and luxury head restraints. You can also specify something called Energising Comfort Control – a package of functions including air conditioning, seat heating/ventilation/massage, surface and steering wheel heating plus lighting and music. There are six ‘moods’ including Warmth, Vitality and Comfort and each runs for 10 minutes, visualised on the head unit and backed by suitable music. Another clever function is the Thermotronic automatic climate control, which works with the GPS to optimise the cabin air quality, for example switching to air recirculation mode when entering a tunnel. This CLS is larger than the previous car and comes with bigger standard wheels but still boasts a competitively aerodynamic shape, which means wind noise is kept to a minimum. There’s also a lot of special suppressive material including comprehensive sealing around the pillarless windows – something made better by the optional double-glazing. Of particular merit are the six-cylinder diesel engines, which are the best-in-model for refinement and silent running at motorway speeds.